Photos from the iPhone album of your choice are stored on Apple Watch, and appear in the Photos app on Apple Watch. When you first get Apple Watch, it’s set to use your Favorites album—photos you’ve tagged as favorites—but you can change the album it uses. And, you can show a photo on your watch face. Browse photos on Apple Watch. 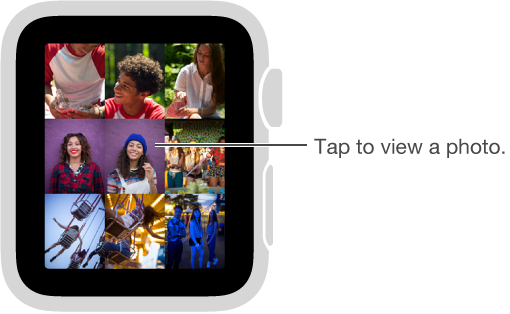 Open the Photos app on Apple Watch, then tap a photo. Swipe left or right to see others. Turn the Digital Crown to zoom or drag to pan. Zoom all the way out to see the entire album. View a Live Photo. Look for the Live Photo symbol in the lower-right corner of a photo, then touch the photo and hold your finger on the display. For more information about Live Photos, see the iPhone User Guide. Show a photo on your watch face. 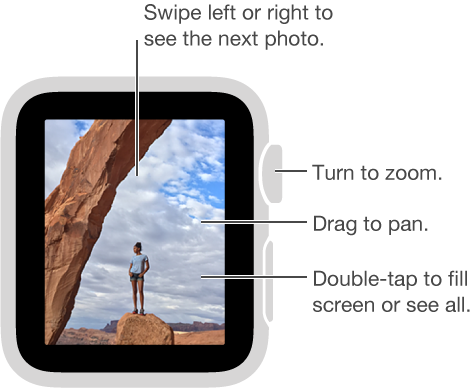 While browsing in the Photos app on Apple Watch, press any photo, then tap Create Watch Face. Or, press your current watch face, tap the New button +, then tap Photo. To see changing photos from the album on your watch face, press your current face, then swipe to the Photo Album face.